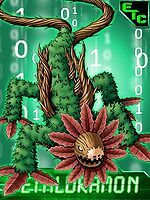 A Digimon that possesses power over Plant, which bears the might of one of the legendary Warrior Ten. 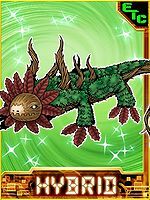 Countless buds sprouted from Arbormon's surface and suddenly grew, and it changed into a form like a giant lizard with plants over its surface. 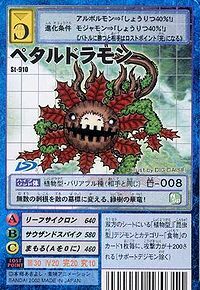 Although it's just like Arbormon, where you can't tell what it's thinking due to its lack of expression, it possesses a great appetite which is the exact opposite of Arbormon, who doesn't require food. When it opens its mouth, it sticks out its ivy-like tongue and swallows anything. When it swallows its prey, the branches on its back grow and it grins eerily just at that moment. Its physical attacks are its branches and tail-whip. It scatters sleep-inducing spores from its moss, which acts as its skin. 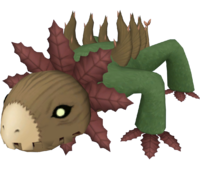 Its Special Moves are rotating the leaves around its head and firing them (Leaf Cyclone), and making innumerable roots lurking in the ground pop up onto the surface all at once, skewering enemies in the area (Thousand Spike). Title: 「木の獣闘士」 — "Beast Warrior of Wood"
Is short for Dragon (「ドラゴン」 Doragon). Anime/Manga Digimon Frontier: "Thunder! Even Rock Breaks! 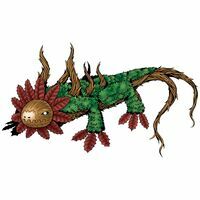 Bolgmon's Do-or-Die Challenge"
Shoots a tornado of razor-sharp leaves either from its flower frill or its nostrils. 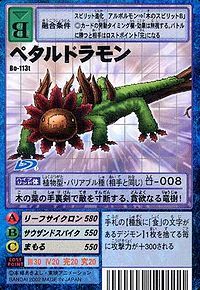 Thousand Spike  サウザンドスパイク Sauzando Supaiku Thorn Jab/Thorn Hook Sends its vein-tails into the ground and grabs the enemy. 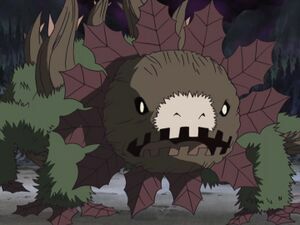 Using the Beast Spirit of Wood Arbormon became Petaldramon. He has a huge appetite and never seems to get full. He once captured some Burgamon to cook hamburgers for him until the Legendary Chosen stopped him. His last fight was against the Legendary Chosen when they were trying to enter the Dark Continent. Vritramon and Shutumon knocked out Petaldramon and Wolfmon scanned his Beast Spirit. 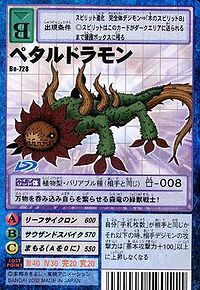 Petaldramon is only obtainable as a collectible card. Its card is part of the Five Evil Warriors Beast (悪の五闘士ビースト Aku no Gotoushi Bīsuto) set. Petaldramon is available as a Digimon Medal. This green, flowering dragon attacks with countless roots which mark its opponents' graves! This forest-dwelling, green draconic beast warrior swallows everything and causes itself to grow in size! Its leaf shurikens tear the opponent to pieces, a greedy tree-dragon! This page was last modified on 26 March 2019, at 10:14.